The death of a loved one, whether expected or sudden, can spark a range of emotions. Alongside the sadness and despair comes the need to organise a funeral which is both meaningful and respectful, an overwhelming prospect when dealing with one’s own grief. 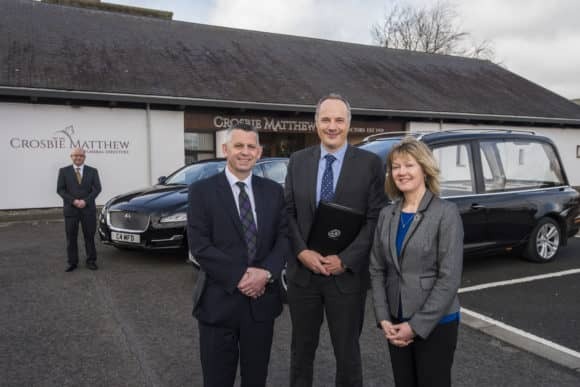 As one of Fife’s longest established family firms, dating back to 1939, Crosbie Matthew Funeral Directors have been supporting families for 80 years, with funeral homes in Kirkcaldy, Glenrothes and Dalgety Bay (Dunfermline). L-R: Alan Morrison (Crosbie Matthew), Steven Todd (EQ Chartered Accountants) and Sheila Matthew (Crosbie Matthew). However, despite the variations in funerals, one constant is the firm’s commitment to taking care of every detail in a professional, respectful and caring manner. Of course, behind any successful business is a team of trusted advisors. For over 12 years, EQ Chartered Accountants has not only handled the firm’s financial records but supported their business growth. Working with Steven Todd, Partner in the Glenrothes Office, Sheila added, “EQ are the ideal match for Crosbie Matthew as we both pride ourselves on offering a personal and professional service. People are at the heart of what we do, and that also applies to the team at EQ. For more information, please visit www.crosbiematthew.co.uk or www.eqaccountants.co.uk.